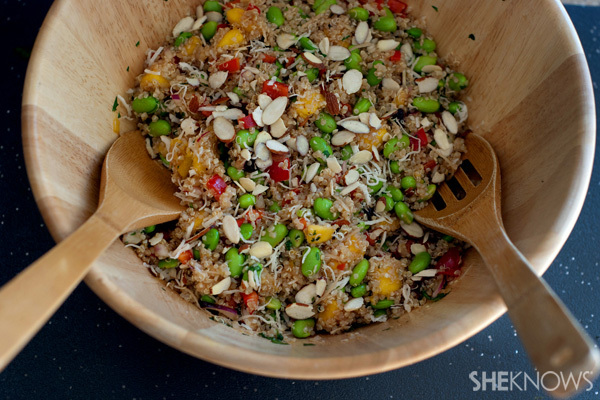 Perfect for lunch or a light dinner, this salad is bursting with quinoa, mango, bell peppers and lots of other ingredients. Learn how easy it is to make this salad right in your own kitchen. I absolutely love shopping at Whole Foods and really enjoy grabbing a container of this salad during my shopping trip, but prepared lunches can get a little pricey. I recreated this dish at home and not only is it simple, it’s a big money saver. It’s easy to prepare and is loaded with different textures and flavors. Fresh mangoes, crunchy almonds and crisp vegetables keep this salad fresh and healthy. Customize this recipe by adding or subtracting ingredients as desired. In a large bowl, add the cooked quinoa and all of the remaining ingredients for the salad, mixing well. In a small bowl, add the fresh lime juice, balsamic, agave and season with salt and pepper and mix well. Pour the dressing over the salad and toss very well. Serve immediately or keep chilled until ready to enjoy.